Text of the public lecture given on 8 July 2007 in conjunction with the official opening of the National University of Singapore Bukit Timah Campus. A new University of Malaya was founded in 1949 in the shadow of the Malayan emergency and the communist victory in China. For the next decade, there was for many the shadow of a “third China”. For others, they worked hard for the failed Malaya/Malaysia project. Only those who wished for a separate Singapore got what they wanted. Bukit Timah campus saw two generations work and play through some exciting times. A third generation has returned the campus at a time when Singapore is in the midst of remaking itself. Will it also live in interesting times? For this talk, I shall focus on three themes, two of which have stayed strong in my memory: the first is the China Presence; the second reflections on the Malaya Dream; and finally some thoughts on remaking Singapore. The talk does not try to tell a continuing story. It is about memories and historical observations that end with a few thoughts about the future. The subject is not so much about the Bukit Timah campus as about the university that was established here in 1949. I shall not talk about Raffles College that first occupied this site but about some interesting features concerning the first generations of students of the university. The first of those included those of both Raffles College and the King Edward VII College of Medicine. My wife and I are delighted to be back on the campus that nurtured us. I assume you too are all here to walk the corridors again. This is where two generations of students grew up, and many went on to run the two countries of Malaysia and Singapore. I am here today not to give a scholarly lecture, but to offer a highly selective sharing of memories and nostalgia, with speculations, reconstructions, evocations and some observations. The subject is not so much about the campus — you will hear more about the campus itself from Kevin Tan — as about the new university that was established here in 1949 and the university renewed, and given a new name, in 1980. I do not need to tell you what a university is, but want to stress that each university meets a need and reflects the aspirations of a state or a people, or a section of the people. With a public university, it is usually the product of the agreed needs of state and society as a whole. 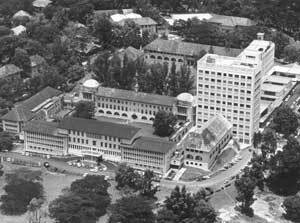 The new university in 1949, the University of Malaya, was essentially a colonial university, one of several in the British Empire that were established on the eve of decolonization. What was distinctive about it was that it was an English-language university in the Malay world and was located in a city whose population was three-quarters Chinese. Thus the name of the university was a decisive statement. The university was to serve all the communities of British Malaya and represented a belated effort to prepare those communities for a future nation to be called Malaya. Two small points of note: the colonial government did not look backwards and call it the U. of British Malaya but looked forward to a Malayan future. It did, however, tie the new university to the Commonwealth university system and that gave it an immediate legitimacy in a large family of universities. Given that background, it is perhaps not too surprising that this new university experienced divisions and reinventions as the world around it began to change. The social and political complexities were great, so the university was probably doomed to divide but it avoided failure by reinventing itself whenever necessary to meet new needs. The three generations in my title refer to the first two that lived through the period of divisions and early efforts at reinvention and then the third that studied at the reinvented National University and has been helping to retool and upgrade it ever since. For the first two, I shall talk about their distinctive features in terms of two images, The China Presence and The Malaya Dream. For the third, I shall look to an image of The Singapore Remaking. I should add that The Chinese Presence and The Malaya Dream overlapped in the hearts of minds of the first two generations, but I shall try to talk about them separately. Let me identify the first two generations of students and we are talking about those in a very small university, rising from about 650 in 1949 to about 3,000 twenty years later. Who were they? The first, those from the late 1940s to the early 1960s were largely products of the English-medium schools in British colonies and protectorates. Most were born locally but very few thought of themselves as members of a nation. The Malays were largely from the Malay States and the Straits Settlements, but some were proud of their origins in Sumatra, Java and elsewhere in the Malay Archipelago. But they were the minority among the students. The non-Malay majority was divided into varieties of Chinese, “Indians” (all those from South Asians today), and Eurasians. Among those who identified with “British Malaya”, were the Malays, the Eurasians, the peranakan or Straits Chinese, and others of Chinese and South Asian descent who had lived there for two generations or more. The rest were varieties of migrants and sojourners. More than two-thirds of the students were not from the island of Singapore. I should add that, we should set alongside this generation at the University of Malaya, the first generation of those who went to Nanyang University from 1956 onwards. They were the products of Chinese-medium schools in Malaya (including Singapore) but also attracted similar students from Indonesia and elsewhere. The second generation went to university from the mid-1960s to 1980. Two events changed the demographics of the two universities. With the University of Malaya setting up a branch in Kuala Lumpur, most English-medium students from the Federation now went to KL. Chinese-medium students went to Nanyang University or Nantah in Singapore. This meant that fewer Malay students went to Singapore, and also meant that the total student body in Singapore was even more Chinese than before. The second event accentuated this change in a different way. I refer to the separation of Singapore from Malaysia in 1965. During the decade after that, the numbers from across the causeway dropped further and became a very small proportion of the student numbers in Singapore thereafter. By the mid-1970s, it can be said that the two universities were Singapore universities and more than 80% of all students were of Chinese descent. It is in this context that I talk of the overlapping images of The China Presence and the Malaya Dream and the residual features of them both that remained significant till the 1970s. Some may argue today that neither has quite disappeared and both images have survived in the memories of those who lived through the first two generations. First, most of these Chinese students were huaqiao (that is, Chinese temporarily living abroad) and claimed by the government of China as its nationals. In 1949, China was at the end of a deadly civil war that the Chinese Communist Party won. In fact, just a few days before the university was founded, on 1st October 1949, Mao Zedong proclaimed that China had stood up. My impression is that most young Chinese both in China and outside felt some pride in hearing that. I don’t know how many of the Chinese students on campus were Chinese nationals but what the idea of being Chinese meant at the time was not always clear. Those born in British Malaya were eligible to become British subjects or to become Federal citizens of the newly established Federation of Malaya, but it was several years later before the majority of Chinese in Malaya could identify legally with the new Federation. Malaya was, in any case, not yet independent – that occurred in 1957 – so strictly speaking, most Chinese were in a state of transition, and still some kind of colonial subjects or, if living in the Malay States, they were called British Protected Persons. In that situation, the Republic of China (in Taiwan from 1949) and the People’s Republic of China (the PRC), both then following the policy of jus sanguines (the law of descent), could stick to their policy of treating all those born of a Chinese father to be Chinese nationals. In short, at the time, any Chinese could apply for a Chinese passport. And, unless they were eligible for some other passport, even those who were local-born would use Chinese passports if they needed one. In contrast, other non-Malay students at MU in 1949 were mostly descended from immigrants from British territories like India, Ceylon, the Malay States, Sarawak and Sabah, and there were some Malays, Chinese and others who had come originally from Dutch territories like Sumatra and Java. There were also Eurasians who could more readily identify with the British. Some were of part-Portuguese descent who could trace their families back to Malacca for some 400 years. Yet others were of part-Dutch burger descent who came some 200 years later, while the few of part-British descent were the most recent. On campus, the ethnic distinctions were kept superficial. As products of English-language schools throughout Malaya, most of the students had grown up with one another and, for most purposes, had habitually ironed out much of their cultural differences. But the shadow of communal politics was not far from where they were and, in Singapore, with its large Chinese majority, the spotlight invariably was on their responses in the context of the politics of China. To underline this further, the Chinese power struggle had been brought to British Malaya since the beginning of the 20th century and had been stimulated by at least two major factors: on the one hand, Chinese revolutionary nationalism (both of the KMT and the CCP) that was critical of British colonialism and imperialism; on the other, the extension of the Sino-Japanese war to Malaya in 1941-1945 that raised communal awareness to a much higher degree than ever in the past. It was this significantly contrary heritage that both the British authorities and the Chinese students at MU had to deal with. The second reason for the China Presence was more immediate. The Malayan Emergency since 1948 was taking its toll of lives and property. This was widely attributed to the Chinese who had founded the original Malayan communist movement in the 1930s. How they gained local support and were armed by the British to fight against the Japanese is a well-known story. But in 1948, the MCP was in a state of war with the authorities in Malaya. In addition, there was another significant factor. In most parts of Malaya, Chinese schools outnumbered English schools by this time, although English schools produced more secondary school graduates who were eligible to study at MU. This had not mattered much when Chinese middle-school graduates could return to China to study at universities there. But with the communist victory in China in 1949, the government was suspicious of anyone who wanted to go to China and would not have allowed them to come back once they went. Thousands of Chinese middle-school graduates (not only in British Malaya but all over Southeast Asia) found themselves denied the chance of higher education. This fact led to the spectacularly popular support for Nanyang University and cast a large shadow on the question of university education for the next three decades. This was the most enduring part of the China Presence. The third reason was the PRC’s decision to side with the Soviet Union by the end of 1949 and become the revolutionary vanguard for East Asia. I had just finished my first year of studies in mid-1950 when the Korean War began. For the next three years, Chinese hostility against the United States and its United Nations allies dominated local images of China. All over Southeast Asia, those images increased skepticism about the political loyalty of local Chinese. The impact on campus life at the University of Malaya was not immediately obvious, but it was known that students were divided on a wide range of subjects, for example, on neutralism and neo-colonialism, as well as on the bitter struggle between the two main groups of Chinese, the Nationalists of the KMT and the Communists in charge in Beijing and fighting in Korea. The China factor increased the pressure on all community leaders to come together to build a Malaya that was free from Chinese and other communal politics. Taken together, these faces of China and Chinese politics appeared somewhat menacing and the shadow of China touched the lives of most of the first generation of hopeful nation-builders, whether of Chinese descent or not. The second part of the university story, the Malaya Dream, was very much the case of “Same Bed, Many Dreams”. The English schools all over Malaya, perhaps more the government-funded ones that included students from all backgrounds rather than the mission schools (where very few students were Malay), consciously taught the students who came from different communal origins to play down their differences under the British flag. After the war, the shift was towards an awareness of a common destiny in a future Malayan nation. The bulk of the students at MU for the next two decades were steered towards thinking “Malayan” and indeed it was that futurist image that dominated many activities on campus. Two questions had an influence on all debates. One was, did being anti-colonial and anti-imperialist make us part of a larger global discourse? The other was, how did anyone build a new nation from the many social groups that had been politically awakened by war, occupation and the diminution of British imperial power? In any case, what was this Malaya that we were taught to believe in? The name, University of Malaya, itself symbolized the future nation for the undergraduates of the first generations. But did they share the same dream? Very early, it was clear that the ideal of Malaya had to compete against other powerful calls, for example, the belief in the unity of Melayu Raya of the Malay archipelago; or, among the Chinese, the fact of Xin Zhongguo (New China) that many found inspiring. Also there was Jai Hind, a call especially appealing to those who had sympathized with the Indian National Army. The question of what language was going to be the national language was a large disputed zone and some even tried to design new amalgams of the main languages in use. These were sensitive times. Under Emergency conditions in Malaya, most students had been taught to reject communal calls and generally to duck controversial issues and focus on the positive features of the Malaya ideal. That was certainly so for most public activities, where discussions would have to be couched in scholarly language and students were exhorted to be analytical and avoid anything that stirred high emotions. But, in small groups of the like-minded, there were more uninhibited appraisals of one another’s political ambitions and interests. For example, among some groups, members would whisper to themselves that communal claims must come first. Let me mention two examples that captured the flavour of extreme positions: at one extreme, Malaya should be for the Malays of the whole archipelago and not only for the Malays of peninsular Tanah Melayu; and, at another, the Chinese had fought the Japanese bravely. They were the toughest and most advanced people in the country, therefore, only they were strong enough to ensure that all the imperialists were driven out. Against this was another set of ideologies, especially among those who believed in the class struggle. For them, only by uniting the workers could the dominant elites be put in their place and the poor be helped. This led to efforts to answer the question whether the Malayan peoples were part of a larger revolutionary movement. Yes, they would say, the fight in Malaya was part of something bigger and only by joining in that Asia-wide struggle was there any chance of getting rid of the imperial masters. These extreme positions attracted police scrutiny. Over the years, several batches of students were arrested and some were jailed for long periods because of their links with banned organisations outside the campus. There was talk of secret cells of communist sympathisers, of “pinkos” or fellow travellers, and accusations against armchair socialists for whom it was all theory and no action. Among some, there was dissatisfaction with social, literary and scholarly clubs and a hankering for political clubs like those in British universities. Eventually, the university agreed to the setting up of the Socialist Club and this attracted many of the most idealistic. That was later followed by the Democratic Socialists who thought the Socialist Club was too leftwing. Nobody at the time seem to have bothered with Conservatives and Liberals – neither was fashionable because they were either too mild or were associated with those British who believed that the empire should strike back. But underlying the discussions and arguments, there was a serious concern for what kind of Malaya was feasible and desirable. There were, in short, many dreams that made the Malaya project much blurred by the differences. The spectrum of causes that were actively supported ranged from Malay nationalism to a variety of Chinese, Indian and Eurasian explorations of identity that played with the idea of a multi-cultural nation. There were also those who were anxious about what it would be like after the British left, those who felt that such a mish-mash of peoples were not ready to rule themselves. Yet others simply hoped for the best and kept their views to themselves. Among those who articulated their concerns, only the Malays felt that their nationalism had an indigenous legitimacy. The others acknowledged their immigrant origins and sought justification for their claims through rights of birth and settlement, something the British encouraged them to demand. Almost everyone was prepared to pledge his or her loyalty to some kind of Malayan nation. What was most striking, however, was that the debates were conducted in a common language, the English of their schools and the campus. This ensured that the protagonists understood one another well and they would not be communally labelled unless they wanted to draw particular attention to their cultural origins. The Malayan dream promised many things, but it did not pretend that it could simply imitate the states of Europe where the principle of nation was based, for the most part, on countries having one language, one religion, and one history. The first generations knew that their Malaya would have several languages and religions and that its peoples had only shared a short period of history together. Thus, they saw the need for a different conception of national identity, something that could be achieved by developing a sense of common identity with everyone owing loyalty to an established state. That state, after the colonial power left, was one that would serve all the people equally while it set out to build a future distinct nation. In the meantime, the voices of hope, the idealism, the enthusiasm, the fierce emotions, the thousands of impractical ideas offered, and the immense confidence that only young people can project, coloured everything the students did for some two decades. Outside the campus, the atmosphere was tense. A war was going on and, two years after the university was founded, in 1951, Sir Henry Gurney, the highest civilian official in Malaya, was ambushed and killed by communist guerillas. On the streets of Singapore, labour unrest was politicized and turned against the British and calls for merdeka and freedom were entwined with calls for social equality. For many, it did not seem possible for Singapore to attain independence on its own and only by joining Malaya could they be rid of colonial rule. But there were also doubts whether Singapore needed to be part of Malaya. The Malayan dream was thus deconstructed several times over. But it remained at the core of the university’s agenda even after the KL division was established and the division here was renamed the University of Singapore. Most of the students were still engaged in asking what kind of dream could be ultimately realized. That provided for exciting debates among themselves and also when they confronted the new political leaders that were emerging in the decade after David Marshall dramatized the need for a timetable for Singapore’s independence. These were the generations who were exhilarated by the thought that a new nation was being created. It was exciting to wonder what kind of political system could come out of the contested visions of political parties like the People’s Action Party, the Labour Party, the Workers’ Party and the Barisan Socialis, to name a few. Although I was in Kuala Lumpur by the time the Malaysia solution was devised, I could see that it was the underlying Malayan dream that was central in the students’ imagination. The battle of Malaysian Malaysia was never far from that dream and Singapore’s exit from Malaysia was deeply related to the failure to realize that dream in the Malaysia equation. I now turn to the third generation and another new university, one that is totally absorbed in the remaking of Singapore. The National University of Singapore combined the University of Singapore with the Nanyang University and the decision, for better or worse, ended the unique experiment that the founders of Nantah had promised. This was the product of at least a decade of recovery and survival. In response to the immediate needs of a Singapore remaking, controls were tightened to fit new plans and meet targets that displaced older hopes. The focus was Singapore and the task of exorcising the China Presence and the Malayan Dream was both painful and reinvigorating. This is a story that others could tell better. I spent some months visiting NUS soon after it moved to Kent Ridge and came back from time to time in different capacities in the 1980s and 1990s before actually coming to work on the campus in 1996. For a newer campus, its time is yet to come. One probably needs many more years for memories to be sweetened and for nostalgia to set in. As you can see, for me, it is this Bukit Timah campus that excites me and triggers memories of the beautiful moments and bitter fights that linger on in my mind. This was where we studied, made friends and hopefully courted our wives. As many of you know, I was one of the successful ones. I have now spent some ten years walking the corridors at Kent Ridge. I have been impressed by the variety of initiatives the students have taken to enliven their activities and stretch out beyond their classrooms. Their social concerns, their artistic urges, their drive for rich cultural performances, their entrepreneurial experiments and, from to time, their political curiosity surprise me. In particular, I am struck how their reach has gone far beyond the borders of Singapore and the region, and are now much less bound by the more specific nation-questioning realms of the two earlier generations. I can understand the makeup of this new university and empathize with the desire among the students for alternate paths of creativity and innovation. But I cannot put my finger on how and what they think about homecoming, either now or earlier on, and that is my excuse for keeping what I have to say very brief. For this third generation of the new Singapore University, there is a fresh challenge that has gone beyond nation dreaming and nation-building. It is how to see the local in global terms and how to bring the global into the local. Only in that way has that generation been able to overcome the confines of an island chained to uncertain hinterlands. There has not been any safety in size, no appeal to a deep history and culture of its own, and no reliable protection that a well-integrated region could give them. Any sense of security has come from forging multiple links between the local and the global, by ceaselessly networking the myriad vanguard institutions and wealth-making centres, and the organisations and associations that continue to drive the knowledge economy. More than ever, this generation still needs to be innovative and creative. The future looks very exciting indeed, but in quite different ways from what made this campus humming with life two generations back. How to conclude? The China Presence cast a long shadow. At its core, it was about people’s basic feelings drawn from their language, religion and customary practices that, in the post-colonial context, looked for freedom to continue, to gain self-respect, to assert difference. But, if their goals were successfully attained, the same feelings also impinged on other people’s freedoms and threatened the social fabric on which the new nation wanted to build a fresh identity. The Malayan Dream was in part to diminish the China Presence and remove all obstacles to a grand unity of the many peoples that lived in the Malaya that was about to be. Perhaps it was too much like an Anglo-Malay compromise to satisfy all the communities. Whether they liked it or not, the students in the new university were to be some of the agents of change to work out the new social contract. Its first two generations produced the graduates that went on to run what turned out to be two countries. And most could look back with pride at what they eventually created. Theirs was a rational exercise aimed at curbing deep ethnic feelings. They acted with a sense of great urgency and shaped the minds to deal with the divisions that endangered the nation. For Singapore, they laid the foundations for social discipline accompanied by flexible thinking so that they could open the economy to the world. For the third generation, neither being national or regional could help secure the state’s remaking. Only by connecting with the new forces of technology and international finance could a way out be found, powerful forces that no one had prepared for earlier on. Can the new university and the third generation who people it ensure that the connections work? Singapore’s efforts to expand its Knowledge Frontiers sounds exciting, but my memories are of a simpler era when we were merely trying to create a nation and not impress the globalized world. I still long for the noisy clatter that once dominated the corridors that you will soon be roaming later this evening.